The figure 220SE is an ideal safety option for compressed air applications with downstream pneumatic equipment. Conventional shut off valves can trap compressed air in pneumatic equipment, creating a potentially dangerous situation. With the 220SE safety exhaust valve, down stream pressure is vented through the body when the valve is in the closed position. 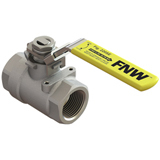 The full port design minimizes pressure drop and the all stainless steel construction provides robust corrosion resistance.